What a stylish groom! The man of the day straightens his bowtie, which is decorated with an intricate black and white design. The bow tie complements his dress shirt, which has light patterns etched into the light blue fabric. This man definitely has a great sense of style. 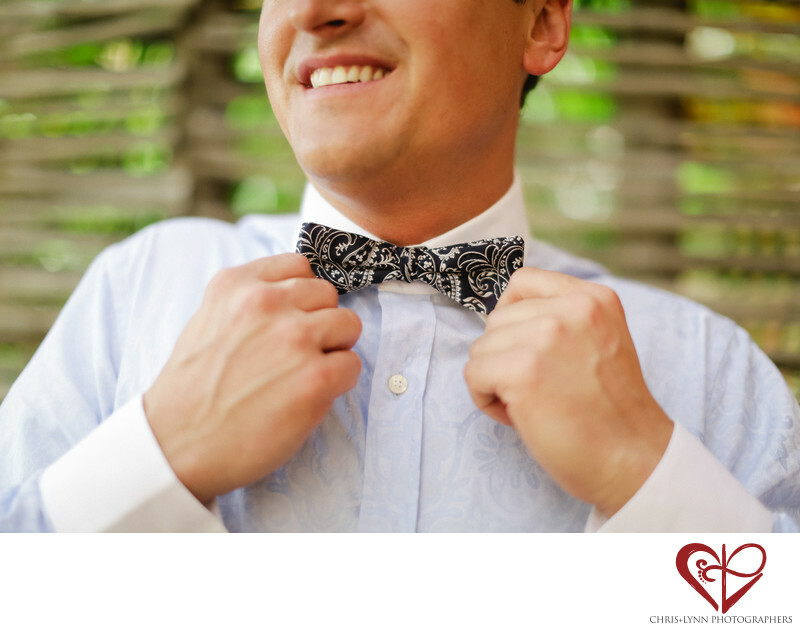 As he tightens his bow tie, the groom smiles widely as he thinks about the big day ahead. After waking up to a beautiful view from his suite at the Esperanza Resort and spending the morning with his groomsmen, the groom is feeling relaxed and excited to see his beautiful bride. The groom stands in front of a palo de arco wall that allows light to filter through from inside, creating a feeling of peace, tranquility, and being close to nature. 1/2500; f/1.2; ISO 400; 50.0 mm.